A collection of both traditional Greek appetizers (mezedes) and Greek Mediterranean inspired appetizers. Octopus marinated with Greek herbs and grilled over an open flame is a Greek classic, and a favorite appetizer to serve with ouzo or wine. We add some olive oil, some red wine vinegar, dried Greek oregano, and some sea salt to make the best Grilled Octopus ever. A traditional Greek triangle pie of spinach, feta cheese, and seasonings baked in phyllo. It is probably one of the best-known of all traditional Greek phyllo pastries and hands down one of the most delicious. These delicious Greek cheese pies are filled with a rich feta filling, wrapped in golden-brown crispy phyllo pastry will amaze everyone. This is similar to Spanikopita and are just as delicious. Dolmades are made from grape leaves (stuffed with rice, seasoned ground beef, fresh herbs and seasonings.) Our dolmades are hand made in house with our famous special recipe and is topped with egg lemon sauce. We offer a vegetarian recipe as well with tzatziki sauce. A great way to sample the taste of Greek Mezes – Four pieces EACH of Spanakopita (spinach pie), Tyropita – (cheese pies), and Dolmades – (Stuffed Grape Leaves). OPA! 2. Hummus is mashed chickpeas blended with tahini, olive oil, lemon juice, salt and garlic Eggplant Spread is fire roasted eggplant mashed with tomatoes, onion, parsley, garlic, feta and olive oil. 4. Taramosalata Often called Greek Caviar is made from the salted and cured roe of the cod mixed with olive oil, lemon juice, and a starchy base of bread. A sensational appetizer for two made for seafood lovers , our famous grilled or Fried Calamari, skewer of grilled Shrimp, and a fillet of fish, topped with onions and parsley. A real value dish of our finest seafood. SAVOUR THE BEST OF GREECE! Your choice of one of our fabulous salads with our flame broiled chicken breast seasoned with Greek spices and olive oil. Your of one of our fabulous salads Salad with one fillet of grilled fish seasoned perfectly with Greek spices. Your choice of one of our fabulous salads topped with a generous portion of grilled shrimp prepared with Greek spices. Your choice of one of our fabulous salads served with delicious Calamari fried or grilled. Your choice of one of our fabulous salads with our incredible Roasted Lamb sliced from the perfect leg of lamb. The recipe is very special and consists of lamb, garlic, salt, pepper, oregano and lemon. Our recipe has been called the best ever! Avgolemono is made from chicken broth, rice, lemon, egg and chicken. . This recipe has been called the great healing soup. A great compliment to any meal. Our popular vegetarian lentil soup is served with a dash of vinegar. A rustic and homely Greek lentil soup, healthy and extra comforting. Faki Soup is with no doubt a trademark dish that has nourished generations! This is our authentic recipe for a delicious traditional delight made from scratch. Greek style vegetarian navy bean soup made from beans, tomatoes, carrot, onion, celery, fresh parsley, and olive oil. The ingredients of the traditional Greek bean soup, is one of the primary foods associated with the heart-healthy Mediterranean diet. Choose your salad and a soup for a delightful combination. A perfect combo for your lite and healthy appetite. Yiayia (Grandma) Despina’s time-tested recipe of oven baked layers of eggplant, potatoes, and ground beef topped with Béchamel sauce. This is an incredibly tasty dish is worthy of being called a Greek Classic. This dish has been called the Greek Lasagna. An oven baked casserole of layered tube pasta, ground beef, and béchamel cream sauce. Every mom in Greece prepares Pastichio for their families. This delicious Greek dish is an Eggplant Shell stuffed with seasoned ground beef and topped with béchamel sauce. Extra juicy and absolutely delicious! If you love eggplant and Moussaka, this recipe is a must try. This classic entrée is a generous portion of our home made Spanikopita. A blend of herbs, spinach, and feta cheese baked in layers of phyllo pastry sheets. Our hand wrapped delicious dolmades are stuffed with seasoned ground beef and rice rolled in grape leaves topped with warm lemon cream sauce. This is a generational recipe from the Thessaloniki region home to the family of our owner. Our Famous Gyro is spiced lamb and beef tightly packed and stack roasts upright, the layers meld together and the grill person manning the gyro roasted cuts of paper-thin slices, served on an open face pita bread with tomatoes, raw red onions, lettuce, Greek tzatziki Nothing is more Greek than the Gyro. A great way to have the taste of Greece. 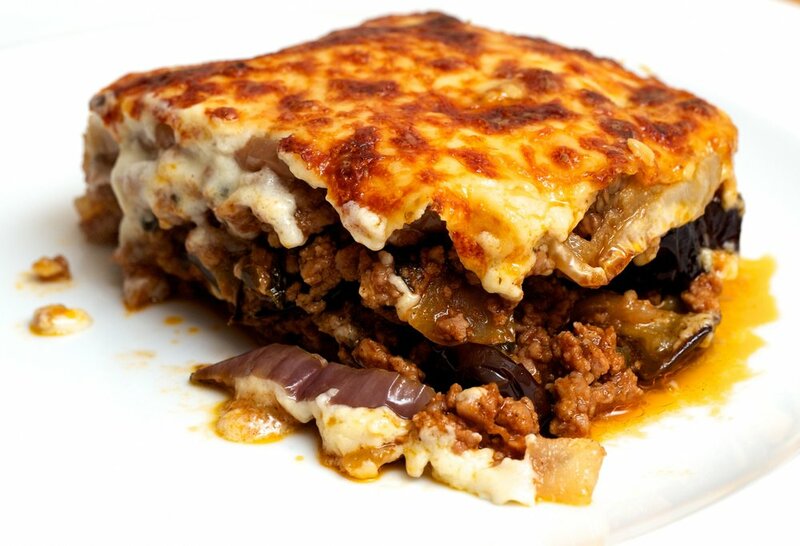 Your choice of a Greek Classic Mousaka or Pastichio served with two Dolmades and Two Spanakopita triangles. Made for two, this combination platter features two Bifteki patties, seasoned grilled ground beef, along with a Grilled Chicken Souvlaki skewer, a Grilled Pork Souvlaki skewer, and Greek Fries, French Fried potatoes with Greek seasoning and Feta cheese. Opa! This meal for two is for meat lovers. Two of our incredible lamb chops, a Grilled Pork Souvlaki skewer, and two Bifteki patties, seasoned grilled ground beef, served with Greek fried potatoes with Greek seasoning and Feta cheese. Opa! Opa! Flamed broiled whole fish seasoned with Greek herbs and spices. The Greeks are known worldwide for flame broiled fresh whole fish flown in daily from the Mediterranean Sea for your epicurean delight. Flame broiled Mediterranean whole fish makes this fish dish very special. A very mild and slightly sweet flesh flavored fish with a small flaking soft-medium texture. Medium in oil content, it lends itself to many different sauces and flavorings. It is best served flame broiled. Tsipoura is a native fish of Greece. It is also known as Dorade (France), Orata (Italy), Dorado (Spain), or in the USA as Dorade Royale. a whole fish served broiled with special Greek herbs and spices. Lavraki in Greek, Loup de Mer in French and Branzino in Italian. A flavorful fish that’s fabulous on the grill. This sea bass is found throughout the Mediterranean Sea but it’s now a scarce fish and one that’s very difficult to catch. In Greece, Lavraki is a near mythical fish, ever elusive. When Greek journalists stumble upon a great story—snag that rare exclusive scoop—they call it a Lavraki. Greek herbs and spices added to this whole fish, make it a real delight. Red Snapper has white meat that is tinted pink from its red skin. The meat is mildly sweet, a lean cut, and is moist. The meat is flaky and tastes fresh. Red Snapper is one Florida’s signature fish. If you are looking for great local seafood, Red Snapper is hard to beat. FLOUNDER - moist fish with a distinctive yet mild flavor, MEDIUM flakes and a firm texture. Your choice of a fish fillet lightly floured and pan fried to perfection in olive oil. One of our most popular dishes cooked in the tradition of the seaside restaurants in Greece. The Greek way! Your choice of a fish fillet wonderfully grilled much like the open air Tavernas that inspired the recipe for this dish. Served on bed of sautéed vegetables - a perfect match. This Lemonato sauce is a mainstay in the Greek cuisine. Your choice of a fish fillet slightly floured and lightly pan fried is smoothed in one of our famous sauces - Lemonato. This lemon and white wine sauce with sautéed mushrooms compliment the fish the Greek way. Your choice of a fish fillet slightly floured and pan fried. Covered with our sautéed spinach, herbs, and feta cheese special sauce make this dish a Grecian delight named for one of the most famous islands in the world. From the Isle of Crete, this lemon and while wine sauce is loaded with artichokes and carrots is served over your choice of a fish fillet of slightly floured and pan fried. Artichokes play an essential role in the Greek cuisine. From one of the ancient Centers of Civilizations, your choice of a fish fillet Athens blends the taste of sautéed tomatoes, garlic, feta cheese, and a dash of the famous Greek aperitif Ouzo , an aniseed liquor all pleasantly covering your choice of Flounder, Basa or Grouper fillet slightly floured and pan fried. A fillet of heart healthy salmon grilled and topped with the Athens Café lemon caper sauce. If you love Salmon, this Greek recipe will please your palate. A grilled skewer of Shrimp or Scallops covered with our sautéed spinach, herbs, and feta cheese special sauce make this dish a Grecian delight named for one of the most famous islands in the world. Served with a choice of Greek Salad or Cup of Soup and one side. One of the great Lamb dishes offered by Athens Café is an epicurean wonder. 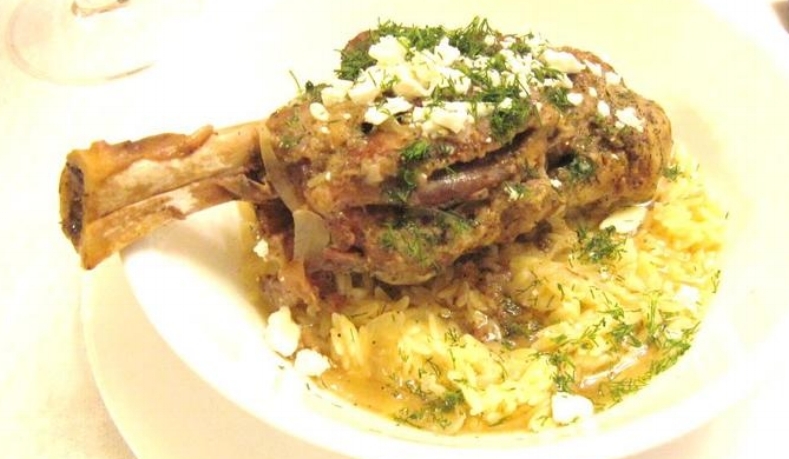 Our oven baked Lamb shanks smothered in a blend of Greek spices (oregano, rosemary, thyme, garlic, salt and freshly ground black pepper) on a bed of tomatoes, green peppers, onions and feta cheese are very moist, flavorful and a great cut of meat. They're perfect for dinner since no carving or slicing is necessary. The meat is so tender it falls from the bone. Grilled lamb-chops (paidakia) are to Greeks as baby-back ribs are to a southerners. Often the rallying cry for a night out is "Let's go for paidakia" and the evening begins at 10 pm and ends hours later after kilos of wine and lamb-chops as the waiters are sweeping up and the other parties are finishing their paidakia and leaving to go to the bouzoukia to listen to Greek music until the sun rises. Paidakia are meant to be eaten with your fingers and like baby-back ribs, require lots of napkins. DELICIOUS! Our Roasted Lamb is made in the oven with roast potatoes and sliced from the perfect leg of lamb. Even today in many villages, the Sunday dinner is brought to the bakery and for a small fee they cook the meal. This was because many homes do not have an oven. The recipe is pretty special and consists of lamb, garlic, potatoes, salt, pepper, oregano and lemon. This dish is found in just about every restaurant in Greece that specializes in oven-cooked foods. Rack of Lamb is so elegant! Perfect for dinner Tender oven-roasted rack of lamb, seasoned with salt, oregano, olive oil and lemon juice. With a distinctively clean, mild and delectable—but never gamey—flavor, this rack of lamb is a superb piece of meat. A grilled seasoned ground beef patty served over pita bread, tomatoes, onions, served with tzatziki, and Greek fries. Flame broiling gives this steak the old country favor top sirloin seasoned with special Greek spices. Our popular pork souvlaki is flamed broiled and seasoned with Greek spices and vegetable. This dish is available in every Taverna in Greece and a dish that the Greeks cannot live without. This Lemonato sauce is a mainstay in the Greek cuisine. A fillet of Pork slightly floured and pan fried is smoothed in one of our famous sauces - Lemonato. This lemon and white wine sauce is sautéed with mushrooms compliment this pork dish the Greek way. A fillet of Pork slightly floured and pan fried. Covered with our sautéed spinach, herbs, and feta cheese special sauce make this dish a Grecian delight named for one of the most famous islands in the world. From the Isle of Crete, this lemon and while wine sauce is loaded with artichokes and carrots is served over a fillet of Pork slightly floured and pan fried. Artichokes play an essential role in the Greek cuisine. From one of the ancient Centers of Civilizations, this recipe for Pork Athens blends the taste of sautéed tomatoes, garlic, feta cheese, and a dash of the famous Greek aperitif Ouzo, an aniseed liquor all pleasantly covering a fillet of Pork slightly floured and pan fried. OUR FAMOUS BAKED CHICKEN "½ of Chicken"
Greek Chicken is prepared to our village recipe perfection. Baked in olive oil, lemon, oregano, and garlic. This dish will transport you to the Sunday traditional meal of a village. Limited Availability Daily! Simple is often better. This describes our flame broiled chicken breast seasoned with Greek spices and olive oil. Just chicken done right. A Greek tradition of a skewer of grilled chicken seasoned with Greek herbs and vegetables. You will think you are visiting the restaurants that line the climb to the Acropolis. Served with grilled vegetables. This recipe is very close to our Italian sister. It features layers of chicken and eggplant baked in tomato sauce topped with mozzarella cheese. This Lemonato sauce is a mainstay in the Greek cuisine. A fillet of Chicken slightly floured and pan fried is smothered in one of famous sauces - Lemonato. This lemon and white wine sauce is sautéed with mushrooms compliment the chicken the Greek way. A fillet of Chicken slightly floured and pan fried. Covered with our sautéed spinach, herbs, and feta cheese special sauce make this dish a Grecian delight named for one of the most famous islands in the world. From the Isle of Crete, this lemon and while wine sauce is loaded with artichokes and carrots is served over a fillet of Chicken slightly floured and pan fried. Artichokes play an essential role in the Greek cuisine. From one of the ancient Centers of Civilizations, this recipe for Chicken Athens blends the taste of sautéed tomatoes, garlic, feta cheese, and the famous Greek aperitif Ouzo, an aniseed liquor all pleasantly covering a fillet of Chicken slightly floured and pan fried. This meatless version of our dolmades features grape leaves stuffed with rice, onion, and dill served cold or warm with tzatziki sauce. This incredible dish are eggplant shells stuffed with fresh tomatoes, herbs, and onions. This dish is real favorite among our vegetarian diners. An Athens Café signature dish consisting of sautéed eggplant in tomatoes. Onions, garlic, and herbs. We know you will be using our homemade bread to clean the plate. We offer two pastas prepared with your choice of our variety of sauces. 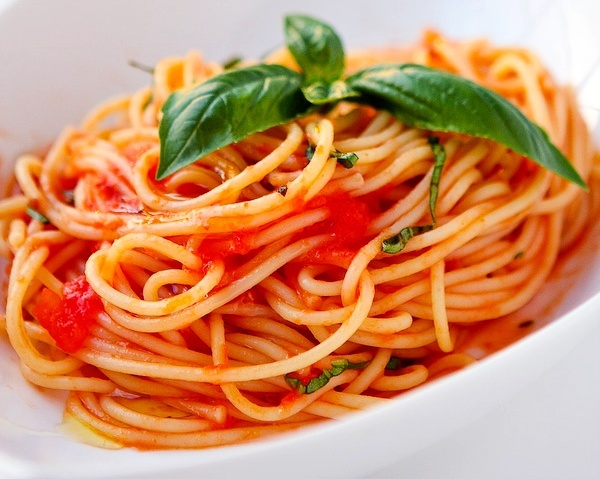 Is a type of pasta is shaped like long, flat ribbons. Indeed, the word "fettuccine" means "small ribbons"
A long, thin, cylindrical, solid pasta. It is a staple food of traditional Greek cuisine. A delightful combination of asparagus, olives, and garlic tossed in a light feta cheese sauce over your choice of pasta Served with a choice of Greek Salad or Cup of Soup and one side. Comes with your choice of soup, salad, or fries. Pitas are wrapped in warm pita with onions, tomatoes, and homemade tzatziki sauce. Our Famous Gyro is spiced lamb and beef tightly packed and stack roasts upright, the layers meld together and the grill person manning the gyro rotisserie cuts of paper-thin slices, which he or she fixes in a pita wrap with tomatoes, raw red onions, lettuce, Greek tzatziki Nothing is more Greek than the Gyro. Grilled top cuts of pork to a tender and juicy finish seasoned to perfection with our signature Athens Cafe's seasoning. 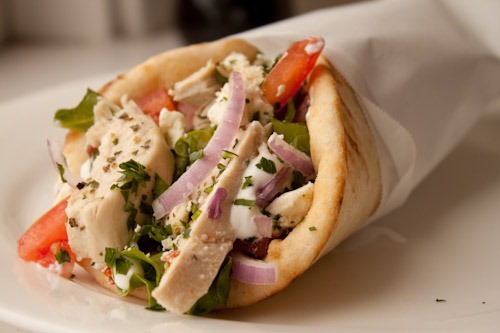 Cut into chunks and served in a pita bread with lettuce, tomato, onions, and tzatziki sauce. A filet of fried Flounder fried served in a warm pita with lettuce, tomato, onions, and tzatziki sauce. A generous portion of grilled shrimp Greek style serve in a warm pita with lettuce, tomato, onions, and tzatziki. A medley of grilled vegetables – Zucchini, tomatoes, onions and peppers served in warm pita served with tzatziki sauce.